The Covenant spacecraft seen in "Alien: Covenant." 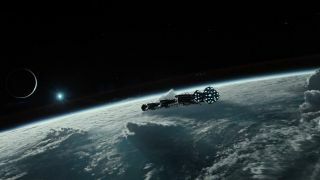 The science fiction film's cast says colonizing space will be risky, but necessary for humanity. LONDON — With their ominous, gory visions of extraterrestrials, the "Alien" movies could cause some viewers to fear space exploration. But the latest movie's cast and production team think any possible danger is a necessary risk to prepare for the possibility of a post-Earth era. "We can't solve global warming," said Sir Ridley Scott, who directed the original 1979 "Alien," the 2012 prequel "Prometheus" and the new "Alien: Covenant." "We would just have to close everything down right now that causes global warming." In the movie, the Covenant spaceship is on a mission to establish a new human colony on a distant habitable planet in the time when Earth is no longer able to sustain human life, as could occur if the planet continues to warm beyond safe levels. And even if we temporarily stop global warming, the sun will eventually become so big that it will scorch the Earth either way (although that is still millions of years away). Scott added that Mars, which is known to have decent water resources, could provide a suitable next home for humanity. Living on Mars currently would be quite a challenge. The first explorers would have to protect themselves against extreme radiation and face freezing temperatures while dealing with the lack of oxygen in the atmosphere. However, if terraforming were possible, the planet could eventually become quite comfortable to live on. Scott didn't repeat his recent remarks to French press agency AFP, which warned that a possible encounter with aliens could only end in a disaster for mankind. Rather, he focused on the idea that space exploration is essential. Katherine Waterston portrays the Xenomorph-fighting heroine Daniels in "Alien: Covenant." In the new film, Katherine Waterston plays terraforming expert Daniels, who fights the iconic Xenomorph. She agreed that space colonization may soon become a risky necessity. "If we trash this planet to the point that we have to go to other places to live, we may find those places, a hospitable planet to sustain human life, but we don't know what we will find there," Waterston said. "It can be powerful enough to destroy us. It makes a good argument for trying to save our planet. But I am fascinated by the possibility of what else is out there." Waterston's co-star Michael Fassbender, who portrays the androids David and Walter, added that damage to our planet necessitating a move elsewhere might be inevitable. "I think Mars is going to be the next destination," Fassbender said. "It's already happening. Elon Musk is working on that right now." For Danny McBride, who plays the ship's exuberant pilot Tennessee, the search for alien life is more a matter of curiosity than necessity. "I think we definitely should be looking," McBride said. "I think that George Carlin says that if we are the only people here, the universe aimed low and achieved little, so we should always be looking."